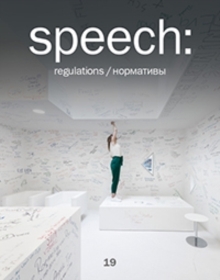 The nineteenth issue of the architectural magazine speech: explores the theme of regulations. This particularly technical and nomenclatural theme has, in fact, at first glance a decisive influence on architecture, largely predetermining both its visual embodiment and all of the main operational characteristics. This issue is focused on regulations in the broadest sense of the word - from the urban norms according to which new areas and cities are built, to energy efficiency standards and fire safety codes, which no architect can omit from their designs. Text in English and Russian.